This is the third version of the great enduro style motorcycle game in which you have to proove yourself as a great driver. The courses are now a bit more challenging but your driving skills are much better than the first time you have played any game of the series so you are prepared to take on the challenge. The goal is to cross the finish line safely without crashing as fast as you can. 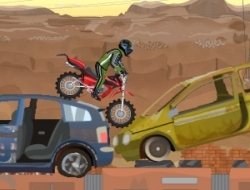 Try to find the right combination of lean and throttle for each type of obstacles and you will score some nice times if you manage to stay on the bike until the end of each level. If you fall though, you will get a few more tries and you can continue from that level onwards, but if you waste your final life you have to start over from the first level. Enduro 3 0.00 between 0 and 10 based on 0 votes.